The wealth of technology and the pervasive reach of media provide today's musicians with a sound palette unimaginable to almost any artist of the pre-Internet world. This embarrassment of riches doesn't necessarily guarantee compositional success. But in the hands of the Winnipeg quintet known as The Duhks‚ it has conspired to create an album that simply shines. The subtle power of the band's approach is evident from the opener‚ "Mighty Storm." A traditional gospel ballad‚ it tells the story of the Galveston Hurricane‚ which killed some 8‚000 people in September‚ 1900. In their version‚ the Duhks wrap Sarah Dugas' galvanic croon in a tight web of percussion and strings. At 1:47‚ Tania Elizabeth's fiddle rips out with the force of a Category 5 -- yet it's not gratuitous‚ but an integral part of the whole. 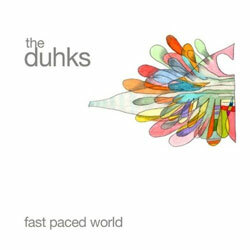 In track after track‚ the Duhks draw on a remarkable range of influences and their own considerable talents to create soul for the new century. The title cut brings the banjo back to its origins‚ combining it with Afro-Cuban percussion in a lament on the devastating impact of commercial culture. On "This Fall‚" Christian Dugas' art-house percussion sets the stage for a Weillian romp. The banjo-and-fiddle driven "95 South" wallows in possum grease. And in "You Don't See It‚" Dugas channels Kim Richey in a pitch-perfect pop gem. If there's a chink in the armor‚ it's the instrumental pieces. Rather than standing alone‚ they figure more as interludes to distract the listener while the stage is being dressed for the next act. Maybe‚ however‚ that's the intent. In a fast paced world‚ everybody needs a breather once in a while.